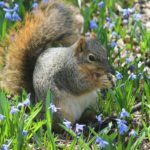 Rabbits, deer and squirrels enjoy our gardens more than we do, it seems, and constantly adapt to our defensive strategies. Minimize your landscape losses through a combination of careful plant selection, physical barriers and effective repellents. The best recommendations of the local landscape industry will answer your questions. Reclaim your time, your expense and your peace of mind. Mel graduated from Eastern Illinois University with a degree in Taxonomic Botany, and served on the Horticulture Faculty of Triton College in River Grove for 20 years. He is currently an independent landscaping consultant, and has been presenting programs in the Chicago area for many years.